On the weekend, I attended a Chinese New Year Ball and saw in the Year of the Goat with lots of eating, dancing and fireworks!! This is the dress I wore to the ball – it’s not red, but isn’t it GORGEOUS?! I found it at a local boutique, Tu Clothing which focuses on West Australian fashion labels, independent designers, as well as popular Australian labels. 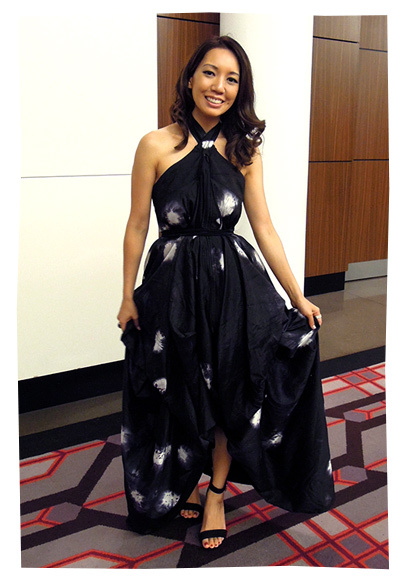 The dress is by 33 POETS, by Rebecca Paterson, one of Australia’s leading fashion practitioners in innovative and experimental design. I recognised her name, as she’s had another label (Breathless) and she has participated in various Fashion Weeks. When I pulled this dress from the rack, I was struck by its beautiful fabric. The sales assistant explained it was “Shibori silk”; Shibori is a technique of Japanese tie-dying. I really wanted to try it on. But when I looked at the garment carefully, it was actually a SKIRT, in Size 10! Four sizes too big for me! The sales assistant assured me that it was actually a kind of MULTI-WAY DRESS, and it would be fine on me. She did some dressing magic on me… and ta da! It was beautiful! I was able to borrow the dress for the evening. This is me, back in my studio. It has some amazing folds, drapes and tucks. The sales assistant tied a few knots in the silk, under the layers, fluffed it up a bit and made it more boofy and Cinderella-like. This is the dress worn as a skirt. The shape is still beautiful, but it was too big for me around the waist, and it was really long. I had to tie the belt a few times around my waist, and bunch it up behind me for this photo. The size 10 works as a dress for me, but not as a skirt. I would love to try it in a size 6 – it’d definitely be a front row, show stopper! And lastly, if you unzip the dress from top to bottom, it turns into a kind of kimono jacket. Looks like a stunning trench coat! You could totally get yourself street-snapped wearing it to a freezing New York Fashion week haha! Again it was a bit too big for me, and again I’d love to try it in a size 6. You can find out a bit more information about 33 POETS, their stockists and look at some of their current designs on their 33 POETS Facebook Page. I know they have quite a lot of their stock at Tu Clothing & Cafe, who are actually having a massive designer clearance at the moment – do check it out!